Kiren Rijiju urged Naga groups and political parties in the state to have faith in Prime Minister Narendra Modi. The Centre said on Tuesday said a boycott of the February 27 Assembly polls in Nagaland was not a solution to the insurgency issue in the state and asserted that the government was bound by the Constitutional process of holding elections. 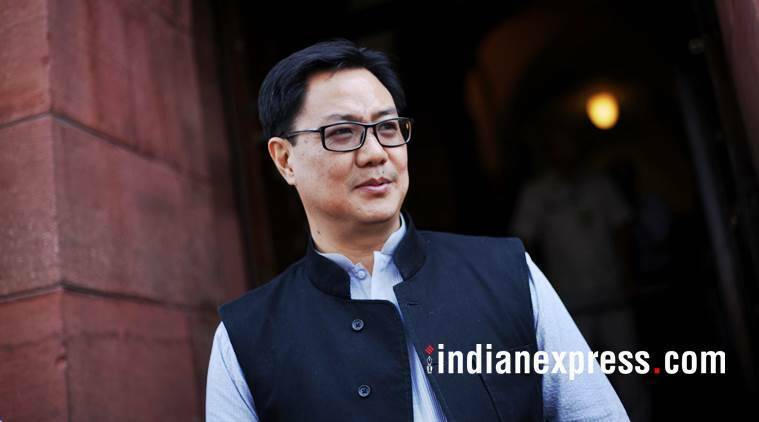 Minister of State for Home Kiren Rijiju, an MP from Arunachal Pradesh, urged Naga groups and political parties in the state to have faith in Prime Minister Narendra Modi. The remarks came in the wake of the Core Committee of Nagaland Tribal Hohos and Civil Organisations (CCNTCHOC) on Saturday urging the Election Commission to defer the Assembly elections in favour of an early solution to the protracted Naga insurgency. Eleven political parties in Nagaland on Monday decided not to issue ticket or file nominations for the elections to press for an early solution to the seven-decade-old insurgency issue ahead of the election. The decision was taken at a meeting convened by CCNTCHOC with leaders of political parties including the ruling Naga People’s Front (NPF) and Bharatiya Janata Party (BJP). In tweets, Rijiju said the government attacheed utmost significance to the Naga issue. He said a peaceful election in Nagaland will facilitate peace talks and also strengthen the government’s commitment. “Holding of timely election is a constitutional process. Government is bound by the Constitution. The government attaches utmost importance to the long pending Naga issue. We believe that peaceful election in Nagaland will facilitate the ongoing peace talks and strengthen our commitment,” he said. The political parties, in their joint declaration, said, “…it is expedient for all the political parties, both national and regional, to come together in the greater interest of the state… with the call ‘Solution before Election’ and defer the elections… and allow the Naga political process to reach its logical conclusion by giving space and time to the negotiating groups to bring out an early solution”. Other signatories to the declaration include the Congress, NCP, Janata Dal-United, Lok Janshakti Party, Aam Aadmi Party, Nagaland Democratic People’s Party, Nagaland Congress, United Naga Democratic Party and National People’s Party. Counting of votes for the 60-member Nagaland assembly is scheduled for March 3. After a meeting with the Core Committee of CCNTCHOC on Sunday, Naga separatists had issued a joint statement warning persons planning to contest the Nagaland Assembly polls and asking them not to sabotage the historical talks by taking part in the electoral processes. The National Socialist Council of Nagalim-Issac Muivah, which signed the Framework Agreement to end Naga insurgency in August 2015 with New Delhi, claimed that the decision to hold elections was bound to undermine the progress in the ongoing parleys. In 2017, the Centre signed an agreement with a working committee comprising six Naga national political groups (Naga rebel factions). On Saturday, the Core Committee wrote to Chief Election Commissioner O.P. Rawat, appealing to him to defer February 27 elections. “The opportunity for a peaceful resolution of the Naga political issue has never been this favourable as the political negotiations are in advanced stage and we can’t afford to distract the focus from the (peace talks) process at any cost,” the Committee said.